Make gift ornaments from all the beautiful Christmas cards you've received. 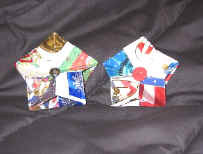 Cut 5 same sized squares out of your Christmas cards. (The larger the square, the easier to handle. The largest I have made is 4 3/4" by 4 3/4".) Fold square #1 lengthwise once and unfold, then widthwise once and unfold, the creases should be so that you only see the outside/colored part of the card. You will have created 4 creased squares. Then, flip the card over and make diagonal folds, fold corner to corner and unfold, then opposite corner to corner and unfold. The diagonal creases should be the inside/written part of the card. You will have created 8 creased right triangles. Then push the outside/colored part together. If you are looking down on it with it in your hands, it should look like an X or a lower case t. The "outside" (not glued to any other squares, showing once all glued together) of the folded square should be 4 creased edges with a point, this point should be the center of the square if it were to be unfolded. The "inside" (attached to 2 other squares, doesn't show once all glued together) of the folded square should be 4 outside edges of the square and the point: the four corners of the square, if it were to be unfolded. Repeat this for the remaining 4 card squares. You can then hot glue the squares to each other. Each square should be glued to 2 other squares. Glue the edges of the square that are not creases (the outside edges) to another square, 2 edges per attached square. Hot glue a small button to the center of both sides of the star. Punch a hole in one of the star points and string some ribbon or beaded string through the hole to hang your ornament.